Although the U.areU. 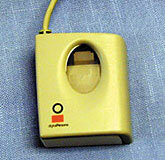 fingerprint authentication reader makes Internet log-ins easier and faster, it doesn't do automatic log-outs. The scanner from DigitalPersona Inc. does fundamental fingerprint authentication and also encrypts your user names and passwords on the hard drive in the Microsoft Windows 9x Registry. Your fingerprint then gets you in anywhere. The U.are.U Pro software, which took about two minutes to install, manages the optical chip that does the scanning. It takes about a second to scan. Other optical chips I've tried can take up to twice as long, both for the fingerprint scan and for account access. Devices with silicon sensor chips tend to work a little faster than optical ones. The Universal Serial Bus connection made up for the instability, however. Most fingerprint devices connect through a serial or a PS/2 mouse port. If you trust a machine to replace your password with a fingerprint, give it the authority to log you on to more than just a PC. You can expect this and reliability from U.are.U Pro.